An inquest into the death of a Storrington man who ‘fell from the roof of Worthing Hospital’ has concluded that there is not enough evidence to determine whether or not he intended to end his life. A jury submitted a narrative conclusion at Edes House, Chichester, today, following the death of Nicholas Weston, on January 17 2016, and highlighted the fact there weren’t enough mental health beds in West Sussex. Nicholas Weston, 23, of Meadowside, voluntarily admitted himself to Worthing Hospital on January 17, 2016, after ‘having suicidal thoughts’, an inquest heard last week. Nicholas attended A&E with his father, Richard Weston, and was moved into a clinical decision unit (CDU) as there were no mental health beds available, according to senior coroner Penelope Schofield. Mrs Schofield told the inquest that at about 5pm the following day (January 18), Mr Weston left the unit and it was found shortly afterwards that he had ‘fallen from the roof after climbing out of a window’. After hearing the evidence, the foreman of the jury said: “The evidence does not fully explain whether or not he (Nicholas Weston) intended that the outcome would be fatal. “Nicholas made a deliberate decision to gain access to the roof, by means unknown and undetermined. The jury also highlighted the need for mental health beds in West Sussex. They said: “Contributing factors to Nicholas Weston’s death include the lengthy delays in accessing a mental health facility due to the lack of availability. Following the conclusion of the jury, Richard Weston said: “I was relieved to hear the verdict. Senior coroner Penelope Schofield said: “I cannot imagine what it must be like to lose a son in such circumstances. 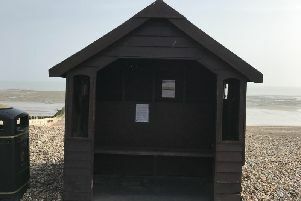 “The jury have clearly identified there is a lack of mental health beds in West Sussex, and what appears to be nationally. Dr. Maggie Davies, interim director of nursing and patient safety at Western Sussex Hospitals NHS Foundation Trust, said: “This was a tragic incident and our thoughts are with Nicholas Weston’s family at this very difficult time.